Ann is one of those people that light up a room by walking into it. She wanted me to thank all of you, who have donated to her just giving page by giving you a a little background to why she chose Alzheimer's to support. The "Blue lady" of the blog title is a description of her mum as in the latter days of her illness she would only wear clothes that were blue! Hi John I want to say first and foremost that you are the outright winner of this Campaign! You have the most generous and kind hearted followers and dear friends on your Blog. The donations they have made in the last 24hrs has been amazing! They have not only supported you & the Samaritans but the Alzheimers campaign as well! I wanted to say a personal “Thank You” to each and everyone for their help raising money for these charities. 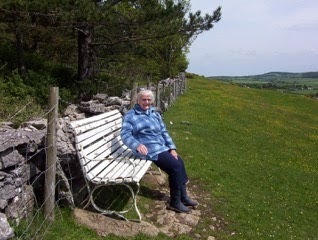 My mother Dorothy Morgan as you know passed away last February after suffering with Alzheimers for 17 years. Although this cruel disease took her bit by bit we created many happy memories, which I would like to share with your readers in the form of photographs. My Mum was always smiling! She had the most beautiful blue eyes. When this first photograph on the left was taken she didn’t know my name but was comfortable in my presence. 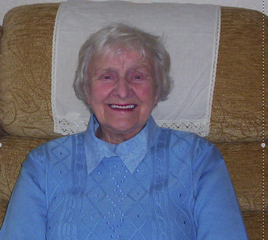 She lived in our village in sheltered accommodation & was able to live independently with daily support from myself and our family for a few years. We would drive up to the Gop mountain which presides over our village and sit on the white bench admiring the view. Mum also enjoyed Christmas and visits from her great grandchildren. Although she didn’t know who they were she loved watching them play together. The last photograph on the right shows her enjoying a moment on her 90th Birthday party. Although in the late stages of Alzheimers with limited mobility and speech her spirit for life still shone through! Please send my sincere heart felt “Thanks” to all your blog readers for their support in making a difference to the lives of these people suffering from Alzheimers who don’t have a voice…. Congratulations again my friend! Catch up soon. I won't be jumping from the high wire but I'll be running for charity in a couple of weeks. I don't need any sponsorship but it's for horse rides for severely ill children. There is so much that everyone can do in their own way. It's why we are here I sometimes think. Good luck to you and John. Ann, you're most kindly welcome! I was happy to contribute since my sweet mother also had Alzheimer's for the last 3 or so years of her life. She didn't forget me, but mentally she became too young to have a daughter my age. Before she stopped talking, she said she walked to school with her friends and once she was crying because she was sure her Mama didn't know where she was. Hugs and assurance that I'd told her Mama where she was took care of those tears. My beautiful mother was 88 when she died. Her name was Dorothy. You're welcome. My, and I know our, pleasure. and I can see her gorgeous blue eyes. I admire you and John . . .
and your zip lining challenge for the Samaritan’s and Alzheimer’s. I have two friends who are living with this devastating disease. We lost my Mother in law to Alzheimers , it is such a terrible disease .. No one is spared the sadness and grief when a loved one is fading away . Good good luck to you with the Challenge ..
Blue was indeed your Mom's colour! She looks good in it. It sounds like she had loving care through the journey of dementia. Dementia touches so many lives in so many ways. Blue is such a lovely color and your Mum looks so wonderful in it. Very happy to support you Ann. Good luck on the zip wire! You will need to call upon all of your maternal instincts to keep Young John calm on September 26th. Please take some tissues and a scotch egg. A huge welcome and thanks to Ann. Such an insidious disease. Good luck with the zip wire Ann. My husband died a couple of years ago after 17 years with Alzheimer's (later diagnosed as Lewy Body Dementia.